In this new collection of reviews and essays, Jonathan Rosenbaum focuses on the political and social dynamics of the contemporary movie scene. Rosenbaum, widely regarded as the most gifted contemporary American commentator on the cinema, explores the many links between film and our ideological identities as individuals and as a society. 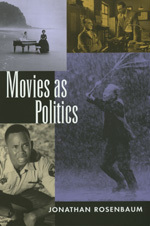 Readers will find revealing examinations of, for example, racial stereotyping in the debates surrounding Do the Right Thing, key films from Africa, China, Japan, and Taiwan, Hollywood musicals and French serials, and the cultural amnesia accompanying cinematic treatments of the Russian Revolution, the civil rights movement, and the Vietnam War. From Schindler's List, Star Wars, Pulp Fiction, Forrest Gump, The Piano, and Ace Ventura: Pet Detective to the maverick careers of Orson Welles, Jacques Tati, Nicholas Ray, Chantal Akerman, Todd Haynes, and Andrei Tarkovsky, Rosenbaum offers a polemically pointed survey that makes clear the high stakes involved in every aspect of filmmaking and filmgoing. Jonathan Rosenbaum is film critic at the Chicago Reader, author of Moving Places (1995) and Placing Movies (1995), both published by California, editor of This is Orson Welles (1993), and a member of the New York Film Festival selection committee.